Webinar On Demand: Hard-to-Fill Roles, Fulfilled! Healthcare roles are among the hardest to fill because of the extreme shortage of available skilled talent. In the U.S., healthcare unemployment dropped to 2.3% last quarter, and yet the industry needs to add 2.4 million new jobs by 2026 to keep up with the needs of an aging population. With so much competition, status quo recruiting just doesn’t work. That’s why healthcare providers Northside Hospital and Advocate Aurora Health are using modern Recruitment Marketing strategies to stand out. They know it takes more than compensation to attract and retain top talent – it also takes a compelling employer brand and an engaging employee experience. 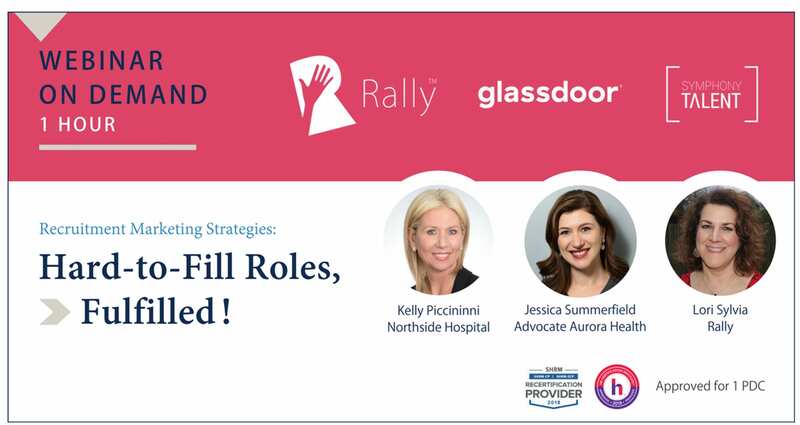 In this one-hour webinar, you’ll get an inside look at the top Recruitment Marketing strategies, channels and technologies that are working for Advocate Aurora Health and Northside Hospital. You’ll walk away with fresh ideas and proven practices for attracting top talent to any hard-to-fill role in any industry. Kelly Piccininni is the Manager of Recruitment and HR Administration at Northside Hospital. With a degree from The Ohio State University, Kelly has been with Northside since 2011, responsible for all recruitment, retention and employment branding for a 16k+ healthcare system managing a team of 40 that include campus recruitment, clinic, allied, residency, advanced practitioners and sourcing team. Prior to Northside, Kelly owned a Franchise of Snelling Staffing for about 5 years and won awards for the Fasting Start Up. Kelly has 5 children and walks 60 miles every year for breast cancer research. Jessica Summerfield is a Social Media Specialist in the Talent Acquisition team for Advocate Aurora Health, the newly merged 10th largest health care system in the US. In her role, she helps to tell the story of the organization’s employment brand through social media, the careers website, various other marketing media and current team members as ambassadors. Her goal is always to make the recruiters’ job easier, helping them to bring the best and brightest talent to an outstanding organization, while maintaining a fantastic candidate experience. Lori Sylvia is the Founder and CEO of Rally™ Recruitment Marketing, an online community forum where the best Recruitment Marketing ideas are learned and shared to help HR, Recruiting and Marketing professionals gain new skills, advance their careers and deliver greater business impact. Lori started out as a technology journalist and then became a marketer of new technologies at five start-ups. Before founding Rally, Lori was Chief Marketing Officer of SmashFly Technologies, where she and her team educated the market about modern Recruitment Marketing practices. With Rally, Lori is working across the industry to inspire more people to become Recruitment Marketers to lead the future of talent acquisition. Symphony Talent is redefining how employers and talent connect with our personalized, seamless talent acquisition solutions. We apply consumer marketing strategies to recruitment marketing, delivering relevant and compelling experiences for candidates, employers and employees. Visit https://www.symphonytalent.com. Glassdoor combines all the latest jobs with millions of reviews and insights to make it easy for people to find a job that is uniquely right for them. As a result, Glassdoor helps employers hire truly informed candidates at scale through effective recruiting solutions like job advertising and employer branding products. Launched in 2008, Glassdoor now has reviews and insights for 770,000 companies located in more than 190 countries. For more information, visit glassdoor.com/employers/index.htm. Rally Recruitment Marketing is an online community forum where the best Recruitment Marketing ideas are learned and shared to educate and empower you to lead the future of talent acquisition. Join the Rally today at RallyRecruitmentMarketing.com. Symphony Talent and Glassdoor are sponsors of Rally. Their sponsorship fee helps us to create educational content and events on Recruitment Marketing.